Every new job, process, and set of skills requires us to gather and retain an incredible amount of new information — a feat made increasingly difficult as life finds new distractions to place in our path each day. Busy adult learners with countless responsibilities require 3 basic things to tackle these new concepts: structure to organize our new ideas, proper support when encountering obstacles, and a method of accountability to stay motivated. It’s probably because you spent a few memorable years using the fundamentals of Blended Learning all the way back in high school! 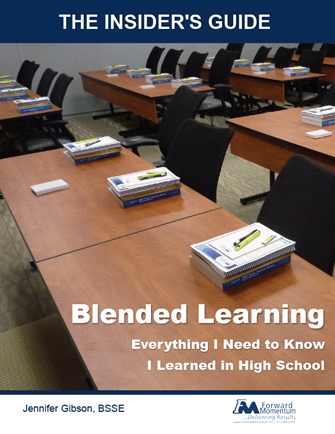 Forward Momentum is proud to present our FREE Insider’s Guide ebook, Blended Learning: Everything I Need to Know I Learned in High School. Filled with all of the tools you’ll need to delve into the past and rediscover your model student status, this eBook will guide you down the road to effective Blended Learning. Download the Insider’s Guide now by filling out the form below, and don’t hesitate to share with others (another lesson from school)! Note: A link to the eBook will be sent to the email you provide.